Help Bob Long & HuntX3 get on TV! 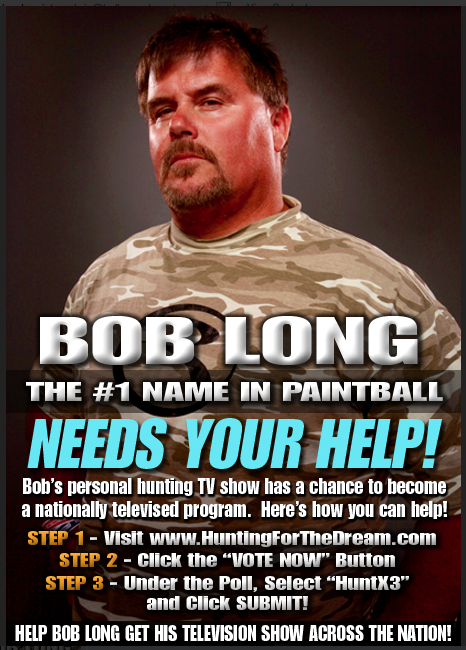 World Champion paintball player turned paintball manufacture Bob Long sends word that he has an opportunity to win a nationwide television broadcast and needs your help. HuntX3, the leading digital hunting publication, is excited to announce that we have been chosen to participate in the “Hunting for the Dream” television competition! Our very own self-produced TV show has a chance to be taken nationwide and we need your help to make it happen! The winner of the Hunting for the Dream competition will be selected through a voting process and we are asking all of our loyal fans to help make our dream a reality. But don’t worry, there’s something in it for you to! We are putting a brand new compound bow from Bear Archery up for grades in an exclusive HuntX3 giveaway! To be eligible, just follow the instructions below, cast your vote for our TV show, and then fill out a simple form for a chance to win a great bow! 4. Then for a chance win the compound bow from Bear Archery, visit www.HuntX3.com, go to the “HuntX3 on TV” page, and fill out the form on the bottom. We thank you again for helping HuntX3 get our great hunting show across the country.